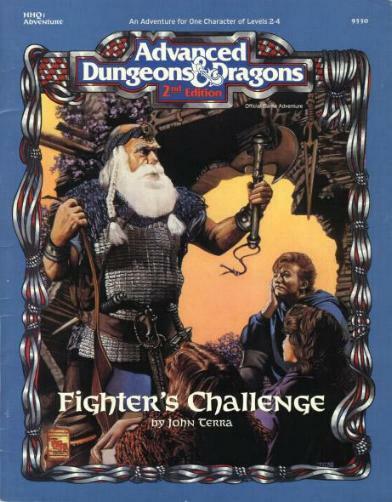 I bought a copy of the 2nd ed AD&D module HHQ 1: Fighter’s Challenge (for $2.98–win) to give Eric and I something to play when our friends were busy and it was just the two of us. For fun, we thought it would be cool to try using Dungeon Crawl Classics RPG to run it, though depending on the leathality/feasibility we may go back to the original system (which we have all the corebooks for). The stats were randomly generated, though with a little bit of filtering on my part. The rest was taken care of thanks to the “peas-o-matic” I referenced in a previous post. The characters are “nerfed” to fit the power level of DCC, but should be able to keep up with (or pose a challenge to) an average to above-average PC. Obviously, I’ll release the rest of the stats as I convert them (read: have time), but for now, Sturnheim can has peasants (and hirelings, oh my)! Valdar: Init : 1d16+2; Atk broadsword d4+2 melee (1d10+deed roll+2); AC 15; HD 2d12; HP 17; MV 25′ Str: 15; Agi: 9; Sta: 7; Per: 13; Int: 10; Luck: 8 (Fumbles); SV Fort +0, Ref +1, Will +1; AL NE. Kalidar Blusterwind: Init +0; Atk -1 melee (1d4-1); HD 1d4; HP 2; MV 25′; Act 1d20; Str: 9; Agi: 10; Sta: 10; Per: 8; Int: 12; Luck: 9 (Magical Healing); SV Fort +0, Ref +0, Will -1; AL NG. Tork: Init +0; Atk +2 melee (1d3+2); AC 12; HD 1d4; HP 5; MV 30′; Act 1d20; Str: 13; Agi: 12; Sta: 12; Per: 11; Int: 7; Luck: 9 (Atk rolls); SV Fort +0, Ref +0, Will +0; AL CN. Equipment: Leather armor, purse w/ 10 cp, 2 sp. Rosamund: Init 1; Atk +1 melee (1d4+1), +1 ranged (1d4); AC 13; HD 1d6; HP 7; MV 30′; Act 1d20; SA Backstab; Str: 15 Agi: 15 1 Sta: 8; Per: 12; Int: 13; Luck: 12 (Fumbles); SV Fort +0, Ref +2, Will +0. Equipment: Leather armor, dagger, sling and 20 stones, thieves tools. Coryn: Init -2; Atk +0 melee (1d8+0); AC 10; HD: 1d4; HP 3; MV 30′; SV Fort -1, Ref -1, Will +2; AL CG. Str: 9; Agi: 6; Sta: 7; Per: 16; Int: 9; Luck: 15 (+1 Ref to escape traps). Tregar Bittermouth: Init 1d16+0; Atk 1d3+1 melee (1d10+deed roll+2), d3+0 missile (dmg: 1d6+deed roll); AC 17; HD 1d10; HP 15; MV 10′; SV Fort +1, Ref +0, Will -1; AL LG. Str: 15; Agi:11 ; Sta: 14; Per:7; Int: 8; Luck: 13 (+1 melee dmg). Equipment: Battle axe, half-plate armor, light crossbow and 12 bolts, horseman’s mace, purse w/ 23 gp. Helak Jestverse: Init +3 ; Atk +2 melee (1d6+2); AC 11; HD 1d6; HP 5; MV 30′; Act 1d20; SV Fort +0, Ref +1; Will +1; AL CG. Str: 14; Agi: 10; Sta: 6; Per: 12; Int: 14; Luck: 14 (crit tables). Spell Check: (1d20 + 2): Patron Bond, Invoke Patron (Olidammara); Charm person; Comprehend Languages; Read Magic. Equipment: Lucky Ring +1, elven cloak, foil, main-gauche, thieves tools, purse w/ 20 gp. Carbuncle Bluckerbuckle: Init +1 ; Atk +2 melee (1d6), +2 melee (1d4); AC 14; HD 1d6; HP 12; MV 20′; Act 1d16 & 1d16 (two-weapon fighting); SV Fort +1, Ref +2; Will +1; AL CG. Str: 11; Agi: 13; Sta: 12; Per: 11; Int: 14; Luck: 13 (languages). Equipment: Studded leather, shield, short sword, dagger, hammer, purse w/ 25 gp. Sereetha Alcoris: Init +0 ; Atk +1 melee (1d4); AC 10; HD 1d4; HP 1; MV 30′; Act 1d20; SV Fort +0, Ref +0; Will +0; AL CE. Str: 6; Agi: 12; Sta: 9; Per: 12; Int: 14; Luck: 14 (spell-checks). Werewolf form: Init +5; Atk bite +6 melee (1d6+2); AC 14; HD 2d6; MV 40’; Act 1d20; SV Fort +4, Ref +4, Will +3; AL CE.